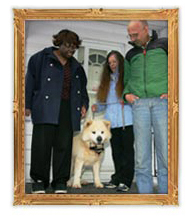 Because of Samuri’s insistence, Don finally stepped outside where he found Kathy and called 911. Kathy, who is still recovering from the effects of her stroke, owes her life to Samuri. "He was her guardian angel that night," says Kathy’s mother, Eileen.